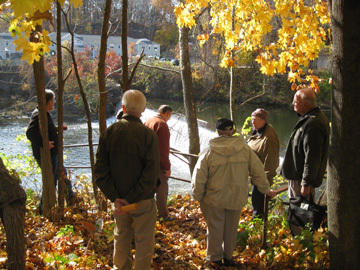 Weather permitting, our open house days during the summer and fall often include a short walking tour along the Green River, from the dam behind our mill building, (on what used to be the continuation of Mead Street) to the Wiley-Russell Dam at the site of John Russell’s Green River Works, the beginning of Greenfield’s metal industry. What a great way to get some exercise, enjoy the outdoors, and learn about our area’s history at the same time! Please join us for a walking tour at one of our open house events, or contact us to arrange for a tour some other time.